Happy (almost) Turkey Day, dolls! I can't even believe tomorrow is Thanksgiving! Seriously where has the time gone?! I am so excited the holiday season is finally here because y'all know what that means: holiday fashion! And what's even better than holiday fashion is holiday fashion that doesn't break the bank! The look I'm wearing above TOTAL cost me right at $100! If y'all saw my Forever 21 shopping haul video (here), you know that I picked up the skirt & the body suit I'm wearing above when I went on this F21 trip. Forever 21 is a great option for your trendy pieces that you don't want to invest a ton of $$ in if you'll only be wearing the outfit a few times. I absolutely LOVE this skirt; the material & quality is AMAZING! I also have always loved tea-length as it gives a classy, refined look to any outfit. It's also perfect for twirling, as you can tell from my photos I had to try it out 😉 ! Body suits are also ideal for pairing with skirts as you don't have to worry about them coming untucked or looking bulky underneath your skirt. Also this one in particular I LOVE because of the detail crochet on the front & the low back. It definitely makes a statement!! So...if you've clicked the link above for the Sam Edelman heels, you may ask HOW this outfit can be under $100 when the shoes are actually $140. Well my friends, let me tell ya about my best friend TJ Maxx! Yes I am a Maxxinista, and yes I bought these shoes there for ONLY $29! So if you have a TJ Maxx where you are, trust me when I say look in the SALE aisle! If you dig around, they have some of the cutest things on sale (I'm talking super cute brands like Sam Edelman). Totally worth the hunt! I can't wait to dress these down with jeans as well during the holiday season! 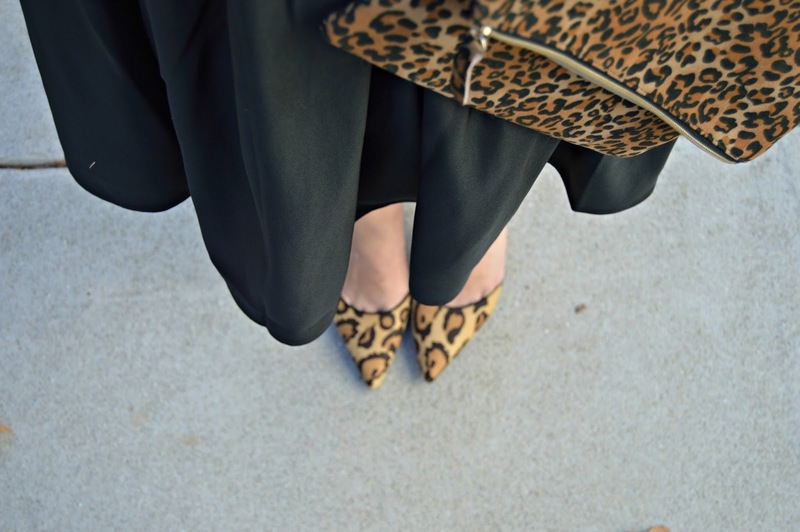 Finally, I love the leopard clutch I'm wearing in my OOTD, and it is from one of my favorite online boutiques Purple Peridot. They normally have awesome sales on the cutest things from jewelry to clutches! Be sure to check them out! I'm so excited to wear this outfit for a holiday party this season!!! I also am planning on pairing this skirt with a bright colored sweater for a different holiday look this season, so stay tuned for that! I firmly believe that holiday fashion does not have to be super expensive but can be fashion-forward AND affordable at the same time! Are y'all excited about Thanksgiving tomorrow!? I seriously can't wait to spend time with those I love the most (& watch the Macy's Thanksgiving Day Parade in the morning; one of my favorite holiday traditions)! I hope everyone has a super blessed day!!! And be sure to check back for a roundup of some of my Black Friday sale picks! Thanks SO much for reading dolls!! !